Whats up! I didn’t realize how bare this summer’s release schedule is. Surprisingly Nintendo has a strong line up, even if it’s not games I’d necessarily want. So far 2017 has been an exceptional year with plenty of strong titles launching Q1 and Q2. I still have a gigantic backlog to finish Far Cry Primal, Watchdogs 2, Doom, Titanfall 2 campaign, Nioh, Persona 5, Nier Automata, Cosmic Star Heroine, Final Fantasy XV (Endgame content/DLC), Zelda BOTW, and maybe Mass Effect Andromeda. I’ll be happy to finish half of these and maybe even stream some of them while I do. Multiplayer gaming is my summer gaming. As noted above you can see that I have a large backlog of quality titles that I actually want to finish, this is not typical for me. I push aside most of my anti-social/singular gaming experiences and embrace playing with others. There will of course be online gaming but what really reminds me of summer is couch co-op gaming. It could be pure nostalgia having grown up in a time if you wanted to play with others you either went to an arcade or had to physically be in the same location. It could even be the change in weather. I know when its sunny I feel like drinking more often. Most multiplayer experiences don’t have an end game or a finishing point, you’re just playing for the love of the game. You’re playing because its fun and you like playing it. You’re not playing to get an imaginary item or a check on an internal video game check list. You play for bragging rights, the challenge, and of course the fun! One thing I’ve always admired about Nintendo is they embrace this philosophy of games being fun. I’m not a diehard Nintendo fan but their games will always have a spot on my shelf because they make fun games(for the most part). I wanted to share some stories of gaming summer’s past and surprisingly they do feature a few Nintendo products. Here’s a nostalgic look at late 90’s early 2000’s gaming. To protect everyone’s identities they’ve been assigned a Persona and code words are being used for illicit activities. I had a neighbor that lived up the street from me who enjoyed gaming as much as I did. We will call him Ness since he was always blabbering to me about how good Earthbound was, to this day I have yet to play it for more than 30 minutes. None of my other friends shared my enthusiasm for gaming as much as Ness did. It was great having someone who lived within walking distance to geek out with especially considering cell phones really didn’t exist yet for the masses. I was still too young to drive and there was no online console gaming. As you might’ve already guessed we were both into JRPG’s. We decided that we should tackle Secret of Mana and actually beat it. I had always played it off and on when it had originally came out, at this point however PS1 and N64 already existed. So it was a dated game on a dated console, Secret of Mana is still a true gem. The best way I could describe it would be a 3 player co-op Legend of Zelda: A Link to the Past. It featured real time combat and 3 characters to play. Randi was your typical clueless white male character that had lost his memory, Purim was a blonde princess, and Popoi was a blend of a dwarf and a faerie. Back in the day most JRPG’s would let you name the characters yourself. We immediately fought over who got to be Randi. Neither of us wanted to be Popoi because he was the short, fat, childish dwarf. I ended up conceding to Ness and plugged my name in for Popoi. We named Purim after some girl that went to school with us, I can’t remember who it was and really wish I still had my cartridge. One concession with the attached names was that we would switch off which characters we got to play. I usually just played Purim because I was still bitter that I had to see Ness’s name attached to the main character and didn’t want to be the little troll. We wanted to beat Secret of Mana, we felt as gamers we owed it to the game itself as well as ourselves. For a few weeks we would chip away and get closer and closer to our goal. We would still occasionally bicker about who got to play who during different sessions but for the most part tried to stay dedicated to our goal. After a while we getting close to the end of the game and knew that our goal was within reach. One summer day we found ourselves in a mall and decided to check out the gaming stores. Back in the day most malls would have 2-3 different dedicated gaming stores. Sadly I cant remember which one specifically we were in, probably either Babbages or EB Games. I was there to look for PS1 games when one of us game across a Super Nintendo cheat code book. I can’t remember who found it but we instantly flipped through it looking for Secret of Mana cheat codes. 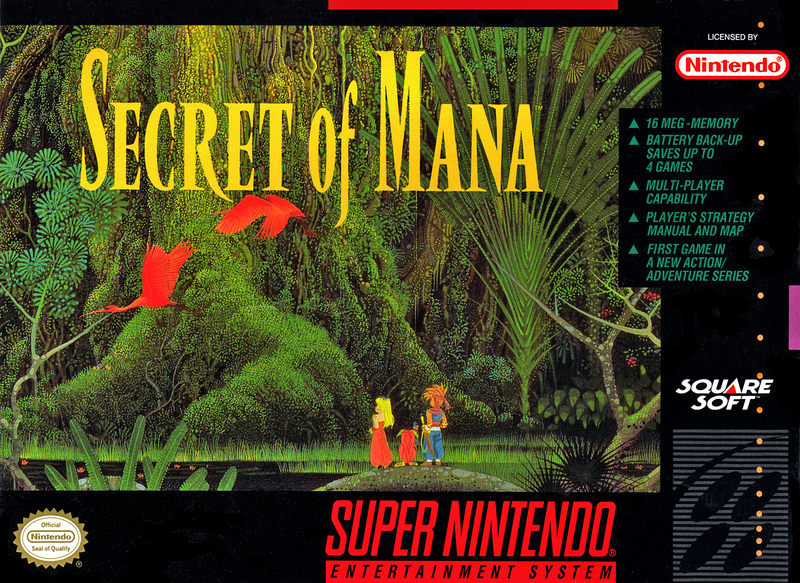 There was one code for Secret of Mana listed in the cheat guide, L+R+Start+Select would reset the game. Why did they even waste the space putting L+R+Start+Select in this guide? It was probably even listed in the games manual however this company had decided to list it as a “cheat code”. At first we had been stoked about the possibility of a cheat code for Secret of Mana and immediately dismissed it as being worthless. Maybe a week later we were coming up on the Mana Fortress, a tough part of the game towards the end. As usual we argued about who got to play who. We settled into our usual rolls and played for a bit when we got to a boss battle. Ness wanted to take a bathroom break so the game was paused. That was when I went and swapped our controllers into different ports and threw a sock over the front of the console so he’d have a surprise after his break. After resuming play and realizing what I’d done along with me laughing in his face Ness decided to use the only cheat code we knew for the game, L+R+Start+Select. Hard reset back to the opening screen. I was pissed because we’d lost all of our progress, there were no autosaves back then. We started to play again in our original roles. I was still salty about his hard reset of our game. I decided to be patient to get the most of my revenge and waited for about 20 minutes of game time to go by, L+R+Start+Select. Hard reset back to the main screen. We tried a few more times to finish the game but both ended up admitting there was probably no way for us to finish Secret of Mana. This is the furthest I ever got in Secret of Mana all because of a stupid “cheat code” and our own immaturity. Secret of Mana is still cherished and holds a spot on my personal top 10 game list. One day I will finish it but I know for damn sure it won’t be with Ness. Anyone who grew up in the 90’s and early 2000s knows what Parking Lot Pimping is. This was a coming of age ritual for kids growing up in the suburbs. Most of us would get our drivers license when we turned 16. Getting a license didn’t mean so much that we could drive a vehicle as it meant freedom. Essentially in our town there were 2-3 parking lots where we would go park our cars or cruise through when we were trying to find something to do. A party, sucker to purchase some silver bullets, or a little PPP (puff puff pass). Between my group of close friends (around 12-20) we had a total of two cell phones and one pager. We had to designate meet up spots and times if we wanted to hang out. Parking Lot Pimping was essential to our social lives in high school. Summers would often lead to dragged out Parking Lot Pimping sessions which we were getting fed up with by our junior and senior years of high school. At this point Gamecube and Smash Bros Melee had been out for a while. I was lucky enough to have a console, copy of the game, and four controllers. I worked three nights a week all through high school as a bus boy at a restaurant. I was fortunate to have such a good job in high school that paid much more than minimum wage. I would usually get off work around 10pm with enough time to cruise a few designated pimp lots to scope out some potential action for the rest of my evening. I had more than a few friends in particular who enjoyed Smash Bros. Meatboy (cause his last name has a meat in it), Spock (a very particular friend with no emotion), Shell (in jr. high he had very poor posture), Larper (cause he’s sleazy), and Slingblade (cause he looks like the guy from the movie). Meatboy, Spock, Slingblade, Shell, Larper and myself also had a golden place for Smashing. We’ll just call it Hansel & Gretel’s house. At Hansel & Gretel’s house there was no curfew, a huge back yard, and a TV room on the other end of the house away from Hansel & Gretel. We had ourselves a great crutch that would save us from perpetually parking lot pimping every night. A typical summer night would start with us Parking Lot Pimping and if we hadn’t sniffed out anything worthwhile we would nab some PPP and head over to Hansel & Gretel’s house with my Cube in tow. Shell especially hated Parking Lot Pimping and was usually the one wanting to steer the boat to Hansel & Gretel’s. We’d get to Hansel & Gretel’s, set up our station, run outside to take in some PPP, and scurry back inside to get our game on. There would be bags of Jack in the Box two for $1 tacos and $1 chicken sandwiches to fuel our gaming sessions. We would Smash for hours. I was typically either Link (both), Pikachu, and Mario. I loved the power of Link’s down-C-stick move, I had perfected slamming down on top of other players heads throwing them off screen. I would spam Pikachu’s lighting bolt move like a noob, yes Blanka is one of my favorite Street Fighter characters. Meatboy enjoyed playing Samus and Donkey Kong. Slingblade would play Captain Falcon, Falco and Ice Climbers. Spock would play Marth, Kirby, and Fox. Shell would use Ness, Falco, and Luigi. Larper played Zelda, Peach, and Jiggly Puff. I loved this group because we all played different characters. We would have play sessions lasting till 3 or 4 in the morning. We were all evenly matched because we played so much. It was rare for me to find friends who would pick up a fighting game and all stay competitive. It wasn’t always all of us but usually a combination of this group. Golden rule was that last place always sat out and would be continually ridiculed for having to sit out. We burned away many summer nights like this. Some people say that video games are a waste of time. The alternative in high school was to drive around in parking lots hoping to find a place to crush some silver bullets. If adults only knew the alternative forms of entertainment to video games. This was always in our back pocket during those long summers and helped forge my idea of summer gaming, we just played because it was fun. We were able to get a few sessions in during college when our breaks would align and we were all back in town. Sadly we haven’t all played Smash together in years, though I’m sure every single one of the group would still get down. Meatboy and myself recently got down on some Mario Kart 8 for the Nintendo Switch. Hopefully we can get the gang back together sometime hit up a few parking lots then go home and play some Smash. Everyone knows what a golden opportunity parents going out of town in high school was. You could throw a rager, have a special someone over, sit at home eating turkey sandwiches, or just have your best buds over. I was no stranger to hosting or participating in any of these over the course of high school. Despite what the movies want everyone to think it usually just consisted of a bunch of guys sitting around trying to figure out what to do or who to invite over. Can we get any girls over? Can we get any silver bullets? Can we get anything? We all got an early start one summer day to try and take advantage of one of these golden opportunities. I had recently come across one of Willy Wonka’s golden tickets and used it to procure some silver bullets for our destination. Meatboy, Shell, Slingblade, Spock, Larper, and Ness were all on the same train. It was early in the day and were trying to set ourselves up for success that evening. It was warm, it was summer, and we had freedom. We had two friends, Barfer and Benzo, who had Xboxes, Halo, and 4 controllers (they had connections at Microsoft). I told both of them to bring their boxes and all 4 controllers because I assumed that either one of them would forget a game, controllers, etc. I wanted to have all of our bases covered. We had a few other friends come over so by mid afternoon there was about 10 of us hanging out trying to decide what to do. Barfer and Benzo both came through with my request and I realized that we had a great opportunity to get some 8 player Halo matches going. I’m totally aware to a PC gamer that this wasn’t a big deal, to casual console gamers this was almost a once in lifetime chance (we had no idea what the future held). We immediately tried trouble shooting how to get the consoles linked up and working together as well as finding an area in the house that had two TVs close enough to each other. It wasn’t easy to just move a TV because they were all still CRT’s. You had to have the proper amount of space, especially for gaming. We eventually got it up and running and split into teams. This was the first time any of us had got to play a console shooter 4 on 4. Each team had their own separate TV, no screen looking, and plenty of people to frag. We were all having so much fun playing 4 on 4 Halo we totally forgot about trying to throw the party we had initially planned to do. Lucky for us because the parental units came home a day early just to find us all being a bunch of nerds. I’ve had some very memorable & enjoyable gaming sessions during past summers. Modern gaming has made it way easier but that would’ve probably taken some of the fun out of it. Heres a few couch co-op games that are a little more recent. I’d consider these uni-gamer friendly so the hardcores and casuals should be able to get along. Any great couch co-op games you can add to the list? Does summer make you think of multiplayer gaming? If not what types of games/activities do you look forward to during the summer? Do you have any summer gaming shenanigans? Let me know.